Ahh Lush. The metropolis of all things bright, sparkly and delicious for a bit of pampering or TLC for the body. I love to use Lush soaps in particular as they don't irritate my sensitive skin, usually smell delicious and last a reasonable amount of time. There are a huge range of products in Lush's arsenal and I decided to buy some that I hadn't use before. Let's face it, the same old things get boring after a while. Also who doesn't like trying guilt-free, handmade products? On with the haul..
Ro's Argan Body Conditioner This is one of Lush's best-selling products and it is easy to see why. This body conditioner is designed to be applied all over like a shampoo and then rinsed off after showering. You don't need to use a body moisturiser after using this either as all the moisture you need is contained in this little gem. This ultra creamy product smells like Rose Turkish Delight, delicious in other words. I don't have particularly dry skin but when I use this I notice my skin feels a lot smoother and softer. It definitely helps for rough patches around the elbows too. Repurchase? Yes, although this is quite pricy it performs really well. If Lush did smaller sizes too it'd be fantastic but this really does last a long time. You've Been Mangoed Luxury Bath Melt This bath melt is designed to be dropped into the bath where it melts all its goodness into the bath, ready for your skin to soak up. This bath melt is formulated with mango and avocado butters and lemon and lime essential oils. When you smell this bath melt in solid form it smells fruity and tropical. Once it has melted into the bath however its scent seems to disappear which is a little disappointing. Much like Ro's Argan this leaves your skin a lot softer afterwards so there is no need to use a body moisturiser. Repurchase? Maybe. While I was a little disappointed with the staying power of this scent I did find it a lovely, luxurious addition to my bath time. Next I want to try the Melting Marshmallow Moment bath melt though. Charity Pot Hand & Body Lotion (sample size) I purchased this because I loved the scent and wanted to support Lush's charitable causes. Its scent is harder to pinpoint but it reminds me of white chocolate and tropical fruits. It is made with cocoa butter and geranium oil so maybe that is why. Anyway, I've been using this as a hand lotion and love it. It absorbs into the skin well and you aren't left with greasy, sticky residue on your hands after applying this. There are a range of sizes of this lotion available and if you're after a hand cream+wanting to do a good deed all at the same time I'd highly recommend this. Repurchase? Maybe, but only maybe because I have at least three full-sized hand creams to use up before I'd think about repurchasing another one. Dragon's Egg Bath Ballistic I love Lush's bath ballistics and this one always looked fun and exciting to me so I was curious to try it. In all honesty I can't remember an awful lot about its scent other than it had a lot of citrus notes. This bath bomb didn't do anything too exciting like some of the Christmas ones, but I loved the dots floating around the bath. Repurchase? No. This was definitely not one of my favourite bath ballistics,mainly because I wasn't overly fond of the scent. The name seemed to have me thinking it would be exciting like the Golden Wonder ballistic they release at Christmas but it wasn't. Other ballistics like Butterball and Rose Queen still remain my favourites for repurchasing. Chocolate Whipstick Lip Balm If cocoa butter and lanolin are a bit too heavy a combo on your lips then this balm is for you. It is more of a lip butter in formula than a stick lip balm but I don't find this drying on my lips in the slightest. Its scent reminds me of Jaffas which are one of my favourite chocolate sweets, so that earns it extra brownie points. This balm is also super handy to throw into your handbag and with its sturdy lid you don't have to worry about this getting damaged in the depths of your bag. Repurchase? Yes. I really love this lip balm although I save it for when my lips are feeling particularly dehydrated as it feels more intensive than some of my other balms. 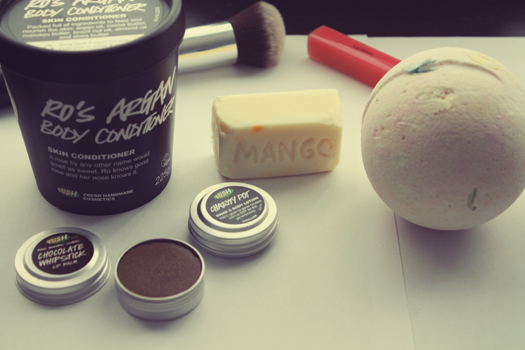 Loved reading this blog post about Lush! I may have to take a trip there.. so tempting haha. Lush is fantastic. I'm tempted to go there again actually. I'll have to check out your blog sometime, love the name.